I was under the assumption this is a native trout. Always what I’ve been told with the red dots above the top of the body. Another guy I talked to just told me it was a salmon. But all the salmon I’ve caught have never had the red spots along the top. It also doesn’t look like a salmon to me. It looks like a brown to me. It could be born in the river. There are wild browns in that area. Native trout in my mind are Brookies and that’s not one of those. It’s tough angle to judge. If the spots on the back are x shapes it’s a salmon. Those fins and shape look very trouty. After looking at this pic again and seeing a v shaped tail I have changed my mind. I’m going with salmon. Last edited by bridgeman; 08-11-2018 at 04:41 AM. 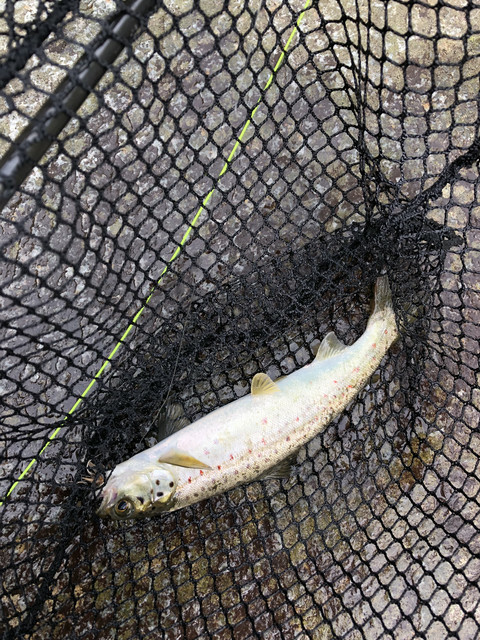 Very hard to tell if it is a salmon or brown from the pic, but most salmon par i've caught have those red dots. Neither salmon nor browns are native to that river... only brookies. It could be wild, but either way... its a fish... nice owrk.